There’s more than one way to celebrate race day you know! Today, we’re making a terra cotta pot race car garden sculpture! Yes, you heard that right! We’re making a race car using terra cotta pots, complete with a race car driver. How cool is that? It’s a great addition to the mulch bed, garden or wherever else you may want to show your love for race day! While you’re psyching yourself up for race day, you can wind down (or up if you have kids) with this fun race car craft. Of course, once you’re done finding a spot for your race car, you can relax and watch the big race! 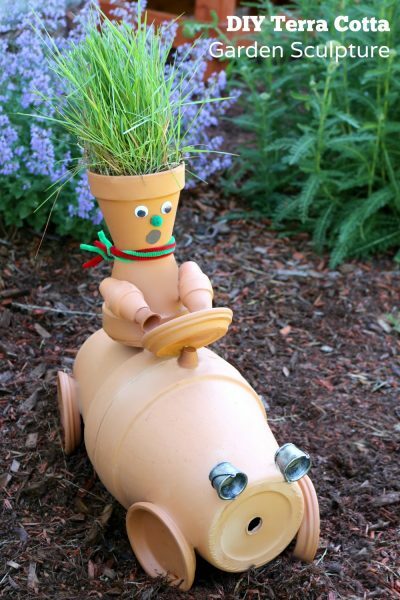 Note that you can use any size terra cotta pots to make your own race car garden decor. So, use what you have on hand — get creative! If you’re going to display your race car outside, use an outdoor waterproof adhesive as it will surely get wet in the rain. We’ll begin by gluing the two large pots together, rim to rim. I found it easiest to stand one upside down on the other while the glue dries. These two large pots will make the race car body. Next, grab the two 4″ terra cotta pots and glue them bottom to bottom. You can also stack these until they dry. These two pieces will be the race car drivers body. Glue 2 sets of 2″ pots together at the rim, just like the 8″ pot. These will be the race car driver’s arms. Next, we’ll use our fairy garden sized terra cotta pots to create hands. Glue one to the end of each arm. (see photo below). While we’re waiting for our race car driver arms to dry, let’s put the tires on our car! Grab your 4″ saucers, you’ll be using 4 of them for this — obviously! Glue them to the front and back of the car, in the position as you would expect tires to be in. Nearest the front and back side quarters of the clay pot car. Secure one fairy sized pot to the top of the car. This one will help hold the steering wheel in place. Once the glue securing that tiny pot is dry, glue one 4″ saucer at an angle for the steering wheel. Use tape to help hold it in place if necessary. Let’s take a quick break and give Advil Film-Coated Tablets a shout out. Fast acting Advil Film-Coated leverages the rapid absorption properties of ibuprofen sodium, now available for the first time in the US. Working with small pieces like on this project always make my muscles act up. The Advil Film-Coated fast acting formula goes to work in minutes! Psst: Get $3 OFF 80ct Advil Film-Coated with this coupon! Now we can put the headlights on our car. Glue two fairy size pots (I had some cool silver buckets) to the front of the car, as seen in the photo below. You can certainly use more terra cotta pots for this, they’ll look just as cool! Don’t be afraid to use painters tape to hold things together while they dry. Now that the arms are dry and the hands are attached, let’s attach the arms to the race car driver’s body! You may want to mock this up to get the proper angle of the arms. Set the body of the race car driver on the car and hold the arms in place, note the angle with a pencil if need be. Glue the arms to the body – you’ll definitely want to use painters tape for this part. I’ve glued a 4″ saucer, upside down, behind the steering wheel. We’ll be able to glue our race car driver to this saucer so everything stays in place well. As you can see, I still have some of the tape in place from gluing his arms onto the body. Finally, we’ll glue on our googly eyes, nose, mouth, give him a scarf and we’ll add some grass hair, or flowers if you choose, to our race car drivers head and place him in the garden! Of course, now it’s time to relax and watch the big race. See, this craft wasn’t too bad! You can display your race car terra cotta craft almost anywhere you’d like. As you can see, mine is going in our mulch bed in front of our house – next to whatever those flowers are (haha) I think they’re salvia and a whole mess of yarrow, too!